Using comprehensive research and unbiased analysis, the first-ever TechnologyAdvice Market Index Report for customer relationship management (CRM) software ranks 24 of the top options to help buyers find the best fit for the unique needs of their businesses. CRM software helps organizations manage their interactions with current and prospective customers by tracking every step of each relationship in one database. 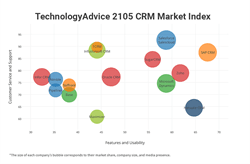 The TechnologyAdvice Market Index narrows a rapidly-growing field of more than 100 CRM products down to the 24 top contenders using criteria based on current industry standards. Leaders separated themselves by outperforming their competitors in key areas such as customer satisfaction and support, market presence, and overall utility. Scoring was based on data collected through user reviews on TechnologyAdvice.com; a survey of nearly 700 U.S. businesses that use CRM software; and online market research. Salesforce Sales Cloud earned the highest overall score in the market index, followed by SAP CRM and Microsoft Dynamics CRM. All three also earned top marks as leaders in one of three focus categories: service and support, utility, and innovation. Salesforce Sales Cloud, 1CRM and Infusionsoft were named leaders in service and support. Rankings in this category are based on customer support availability and options across multiple channels, as well as user reviews from current and previous customers. SAP CRM, Netsuite and Zoho ranked as leaders in utility, representing the platforms that offer the most comprehensive out-of-the-box features. Microsoft Dynamics CRM was joined by Sugar CRM and Oracle CRM On Demand as leaders in innovation, which was based on percentage of distinctive features and longstanding reputation in the market. The full market index chart for the best CRM software visualizes the top 15 options. For more information on the report’s rankings and methodology, download the full TechnologyAdvice CRM Market Index Report from TechnologyAdvice’s research library. TechnologyAdvice is dedicated to educating, advising, and connecting buyers and sellers of business technology. As a trusted resource in a variety of technology verticals, the company helps buyers improve their businesses and vendors find their customers. Through unbiased research and crowd-sourced product reviews, TechnologyAdvice provides the insight that buyers need to find the right technology solution. TechnologyAdvice is based in Nashville, Tenn., and was named to the Inc. 5000 list of America’s Fastest-Growing Private Companies in 2014.